Yes, I admit it; I am a huge Beatles fan, so one can say that I am quoting greatness here. But, I am also thankful that we are putting winter behind us, and like most East Coasters, I welcome the sun! At Interior Excellence, we spend most of the year inside, renovating the interiors of homes. We specialize in creating state of the art kitchens, exquisite bathrooms and beautiful basements (media rooms, game rooms, gyms). But, summer is upon us, and we also like to move outside and have some fun. We all long for summer vacations, where we take a week or two out of our busy lives to spend with loved ones, engaging in some of our favorite things, and then (unfortunately) it is back to the daily grind. At Interior Excellence, we know it is possible to create an oasis in your own backyard. And every day, whether you are entertaining guests, having a picnic with family, or taking a 15 minute break to relax, sit back and “smell the roses”, you can vacation, in your own back yard (without ever leaving the home). And, I am here to share our secrets. 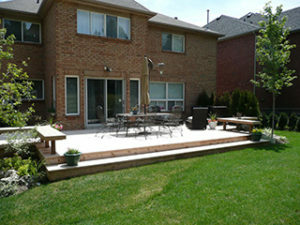 Do you have an existing deck that you want expanded or have you been dreaming of building a new one? Whether you want to build a simple platform outside of your home, or create a small, medium or multi-level deck, we are here to guide you. If you want to extend your living space, but are unsure how to do that, we can provide you with many choices and options. With expertise in design as well as construction, we are happy to offer design advice and vision. If you can envision it, we can create it. Let us help you create an outdoor sitting area, complete with a fire pit. Whether entertaining friends or family; there is nothing like bonding over a fire. You can grill food or relax, toast marshmallows and make smores (Ok, well maybe I am showing my age here, since my own kids have no interest in smores). The fire pit can be used all year long, and is an attractive feature that will add value to your home when you go to sell it. Create your own sculpture garden in your backyard. This year, I was inspired by the Grounds for Sculpture in Hamilton, NJ. (If you have not been, I highly suggest it). Motivated and rejuvenated, I decided to step back, channel my own creativity, and began a journey that has brought me great pleasure. I created my own sculpture garden (with finds from local Home Goods and Garden Stores). With my own sculptures and treasures, all carefully placed in my yard, I escape (even for 15 minutes a day) and I emerge refreshed! With three plus decades of experience behind us, licensed and reputable craftsmen and happy customers, we pride ourselves on our reputation and we are at your service. Call Myles Albert at (908) 218-0200 to schedule a free in-home estimate. Summer is fleeting and the time is now!